For all three men, the murders causes a crisis of conscience and the drama lies in seeing whether they will have the courage to be "woke" and the provocation of the same question in ourselves. Maybe I would join a protest. I know I couldn't post a video, knowing the police have already been stalking my house, with my sleeping child next to me. For me, the most fascinating character is the cop, and it's interesting to contrast this character with Washington's role in BLACKKKLANSMAN. In that movie, the most brutal racism is depicted on screen but Spike Lee also had the wit to give us moments of hilarity - walking a very fine tonal line. This movie - from talented first time writer-director Reinaldo Marcus Green - is far quieter and more interior, and so calls for a more nuanced, in some ways more powerful performance. The opening scene of this film is thus its best. We see a character we know is a cop, but off duty, pulled over and ID checked by a white cop. The camera focusses on Washington's reaction - quiet anger - knowing if he acts out he will be subject to brutality. The same brutality his colleagues mete out onto other black men in the neighbourhood. The resulting film is beautifully acted and deeply powerful and doesn't shy away from tough questions and debates. It's sadly too relevant. It also paints an authentic picture of a community on the edge. 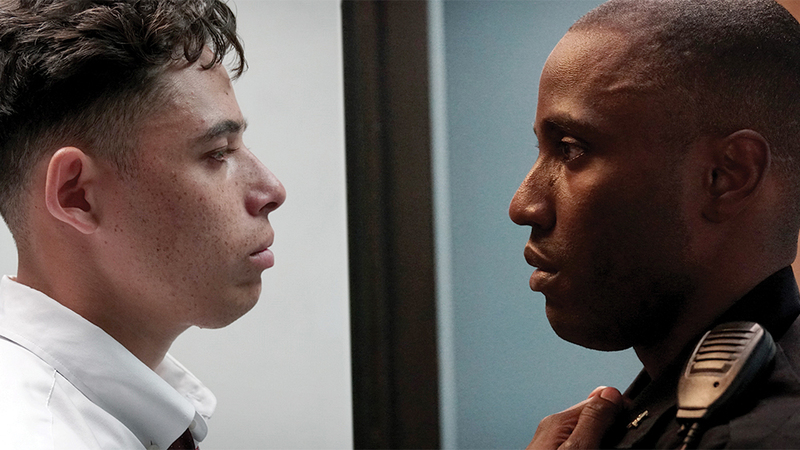 MONSTERS AND MEN has a running time of 96 minutes and is rated R. It played Sundance 2018 where Reinaldo Marcus Green won a Special Jury Prize for Outstanding First Feature - Dramatic. It also played Toronto. It was released in the USA last September and is currently on release in the UK in cinemas and on demand.